While dogs are well-known for playing fetch, some cats also like to play the game. Siamese heritage cats and young kittens, in particular, enjoy retrieving toys, though any cat can learn it. Your cat may even show a natural instinct to retrieve when, for instance, it brings you a mouse as a "gift." It may also capture a fluttering moth only to let it go or bat a toy mouse down the hall. The only other element needed is for the human to do the honors and toss the toy, then entice the cat to bring it back. Teaching this game is a good interactive way to help your cat release some energy and remain mentally sharp. Fetch can also offer exercise to slim down tubby tabbies. Not every cat will fetch, but it is a fun game to attempt with your cat and there are a few simple steps you can take to encourage it. When you want to keep your cat's attention and teach it something new, it's often best to do it in a distraction-free environment. Find a quiet spot in the home, preferably a room with few obstacles and a small area that restricts the playing field. Most kitties choose their favorite things to fetch. You'll find it easiest to follow your cat's natural preferences when introducing the game of fetch. For instance, your cat may be most interested in a catnip mouse, a wad of paper, a soft sparkle ball, or even a particular treat. Some cats even enjoy chasing kibble across a hard floor. Though they may not bring it back, they might return to "ask" for another toss. Figure out what your cat will go after most, then play with that toy. Timing is key and you know your cat's habits best, so choose a time when you know kitty is up for a game. Even if it's convenient for you, the game will go nowhere when your cat is down for the count during naptime. Some cat owners find that their cat is most receptive to training and willing to pay attention to them just before a meal. While dogs tend to go nuts with fetching marathons, remember that cats are masters of the sprint and dash. Ten minutes is a long time in cat-world, and you want to leave your cat wanting more. Stop the game before the cat calls it quits—five minutes is good for most cats—and it will be more likely to ask for a repeat. Does your cat want the ball to bounce or does it prefer to paw-wack paper across the room? Make like a cat and copy its favorite playtime activities. It will show your pet that you understand the game and want to join the fun. Cats speak with fluffed fur, eye and tail positions, and meows, but they certainly understand a variety of human words, too. Link the action to a word to help your cat understand each time the game's at hand. Say something like, "Fetch, kitty-kitty-kitty!" in a high-pitched, happy tone after you've tossed the toy across the room to entice your cat to bring back the toy. If your cat has already been clicker trained to come when called, use your "come" command linked to the "fetch" word. For cats that fetch naturally, simply picking up the toy and tossing it again is often enough of a reward. If kitty enjoys chasing kibble or other treats across the floor, the reward is eating it. Other cats may be more inclined to repeat the game of fetch if you offer an actual treat. Again, follow your cat's lead and offer whatever reward it likes best to encourage good behavior. As your cat gets used to the game, move it into a larger room or an area with more distractions. You can also get another person involved: Sit on opposite sides of the room and take turns throwing the toy between each other. This can help your cat learn that it's fun to play with other people as well. You may find it best to keep the toy you play fetch with out of your cat's reach when you're not playing. This can add value to the toy and help make your time playing the game something your cat looks forward to. Once your cat is repeatedly fetching one object, try tossing another toy and use the same verbal cue to entice it to fetch. 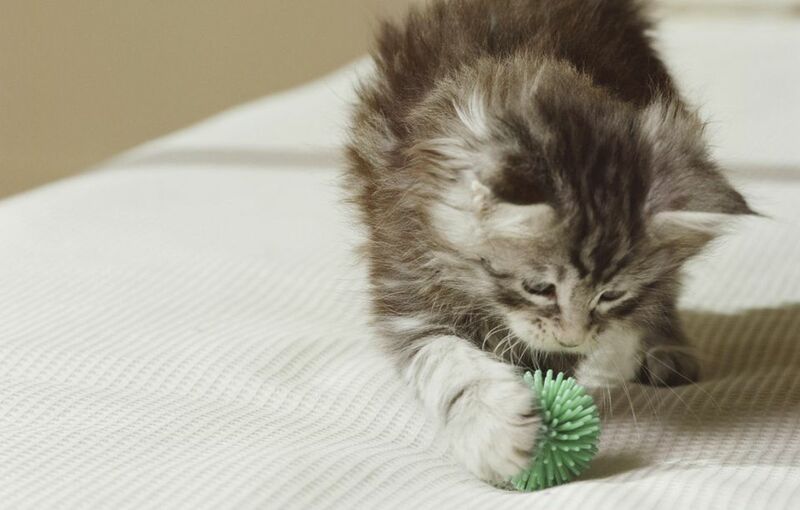 Ensuring your cat will retrieve a variety of objects is a good way to encourage exercise even if that prized possession gets lost or damaged and needs to be replaced. If your cat couldn't care less about fetching, don't despair. You can still have great fun with other kitty games and interactive toys. Plus, some cats may simply think humans need to pick up after themselves, instead of expecting the cat to bring it back. They're funny like that.